Ultra high grade and overall impressive Montana RC. Beautifully preserved and easily representing of the very best PSA 10s we've seen in person. Dead cetnered with four flawless corners and stunning surfaces throughout. This card is special; simple as that. 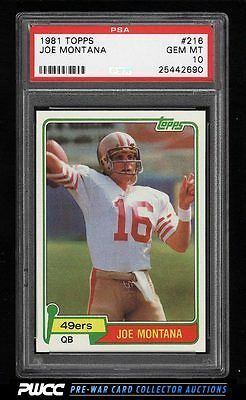 Part of a tremendous run of high grade Joe Montana rookies on the auction block this month. One of nearly 17,000 cards, lots, and sets up for bid in our 8th Auction of 2016. Click on the link above to view the other PWCC auction lots.